Facebook embedded posts are finally now available to everyone on Facebook. When you embed Facebook posts, this doesn’t just mean you’re now able to post Facebook updates to your website or blog. You now have more opportunities to leverage your blog or website as a way to build and grow your Facebook presence. Learning how to embed Facebook posts is very easy to do and takes just a couple of minutes. Follow these three steps to learn how to embed Facebook posts on your blog or website. To embed Facebook posts on your blog or website, watch the video below. What types of Facebook posts can you embed? The only type of Facebook post that you can embed are public posts. Can I embed someone else’s Facebook post? Yes, you can embed a Facebook post from your friend or anyone else you follow on Facebook as long as the post is set to public. Can I embed a post from a Facebook Page? Yes, you can embed a Facebook post from a Facebook Page as long as the post is set to public. Can I embed a post from a Facebook Group? No, you can only embed a Facebook post from a Facebook Page or Facebook Profile that is set to public. What is included in a Facebook embedded post? When you embed a Facebook post on your blog or website, people on your site have the ability to like, comment, and share your Facebook post. Without being on Facebook. If I embed a post and the author then deletes the post or changes the post audience selector from public, what will happen to my embed? Yes! You can set the width to be between 330 pixels and 750 pixels. How do I center an embedded Facebook post? To center an embedded post, select the Text option in WordPress and add the <center> and </center> tags around the first and last tags Facebook provides. If I embed a very long post, will it get truncated? Yes the post will get truncated with a “see more” option. Clicking “see more” will display the full post on your web page. How do I view the embedded post on Facebook? To view the embedded post on Facebook, simply click the date. How do I find public posts on Facebook to embed? Please visit our best practices guide for finding public posts on Facebook to embed. Embedded posts offers a lot of great opportunities to boost your presence on Facebook such as your Facebook Profile, Facebook Page, or Group. 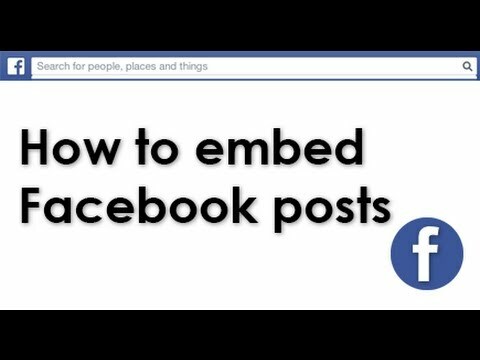 It is also easy to learn how to embed Facebook posts, which means we should see more people using embedded posts. What did you think about learning how to embed Facebook posts? Did you find the process easy or difficult? Let me know in the comments below.